Inspired by memories of writing songs on her own Baby Taylor, Taylor Swift collaborated with Taylor Guitars to design the Taylor Swift Baby Taylor (TSBT). 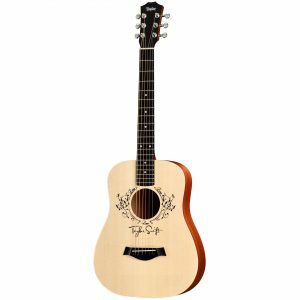 Based on the compact ¾-scale Dreadnought, the TSBT is crafted from a resilient layered sapele body with a solid Sitka spruce top. Swifts screen-printed rosette design features the word Love three times among a delicate vine motif. 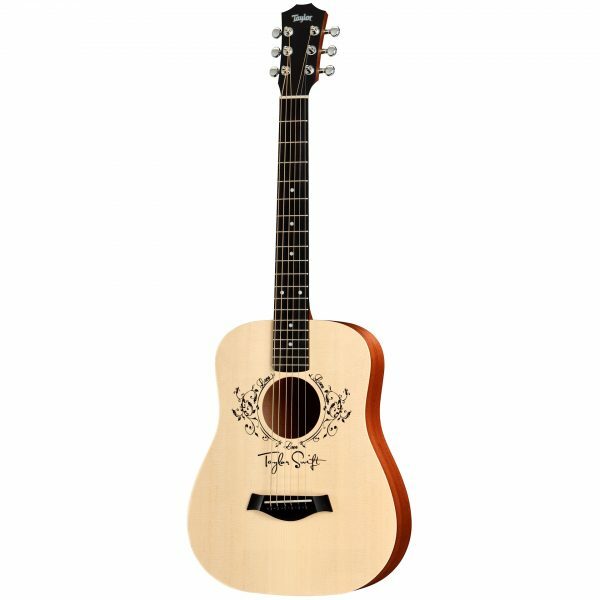 The personalized design also features her stylized signature above the bridge. With a slim 1 11/16-inch neck and a compact shape, the guitar is perfect for a young, aspiring tunesmith. This edition also features the Expression System Baby (ES-B) pickup for a smooth plug-and-play experience. Adding to the utility is a built-in digital chromatic tuner on the preamp. The preamp/tuner unit features an LED display for tuning and low battery indication, along with Tone and Volume controls. Brand of Strings Elixir Light Body Length 15 3/4"